"3 MINUTES WORLD SILENCE" takes place each January 1st at 11 o'clock in the morning, local time. Its message is "for every one of us to remember the future and to wish for peace." 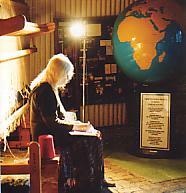 Founded in 1983 by Mary Cassini, a weaver and actor, the first World Silence took place in Pike's Brewery, Oakbank, South Australia, at the eleventh hour on January 1st, 1984. To tell everyone about the World Silence, Mary wrote letters to many people worldwide. In 1986, with her husband, Peter Stapleton, she travelled around the world to tell people about the event. In East and West the idea was universally supported "for our children and for the future of mankind." In 1987, Mary was invited as delegate to Mikhail Gorbachev's "Moscow Forum for Human Survival", and in December 1989 her initiative received front-page coverage in the Russian newspaper "Pravda". Exhibitions for the World Silence have been displayed in many places. Exhibits include The Globe of the World, lighting up the earth's 36 time-zones, prepared by students of Birdwood High School, SA. An historic "Book of Letters" written to Mary by leading world figures, accompanies the globe. Notable exhibitions were in Parliament House, Canberra (1990) and Jerusalem (1991). The Eleventh Hour Tapestries comprise eight tapestries woven by Mary between 1990 and 2007. Some of these have been publicly exhibited, including in Parliament House of South Australia. One, "The Healing of the Nations" was hung in UN Palais des Nations, Geneva, in 1993, during meetings between the leaders of Former Yugoslavia. Mary hopes to hang these tapestries in areas of conflict to help resolve issues. Above: Mary with the Globe Of The World.